Cornelia Martha Oakley, age 84 of Lake Isabella passed away at her home on Friday, July 13, 2018 with her loving family at her side. Cornelia was born on May 30, 1934 to Kenneth and Estella (Adams) Hinkle in Lansing, MI. and she was raised in the Lansing area. Cornelia married William J. Oakley on November 1st, 1952. 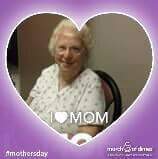 She loved fishing, crafts, her flower garden and especially spending time with family. William; children, Deborah Mestemaker, William Jay (Kathy) Oakley, Teresa Ann (Thomas) Marietta, Patsy Jo (Donald) Houghton, Benny Dee (Brenda) Oakley; 17 grandchildren; numerous great grandchildren; and brother, Kenneth W. Hinkle. Cornelia was preceded in death by her parents, granddaughters Tian and Heavenly Shelden. In keeping with Cornelia’s wishes, cremation has taken place. A private family graveside service will be held later. The family has entrusted arrangements to Maier Family Funeral Home, Weidman, 989-644-5000.